A warm welcome to my blog's newest followers - so glad to have you along! I hope everyone has had a great week, and that wherever you are, you are keeping warm. It is Friday (hooray!) 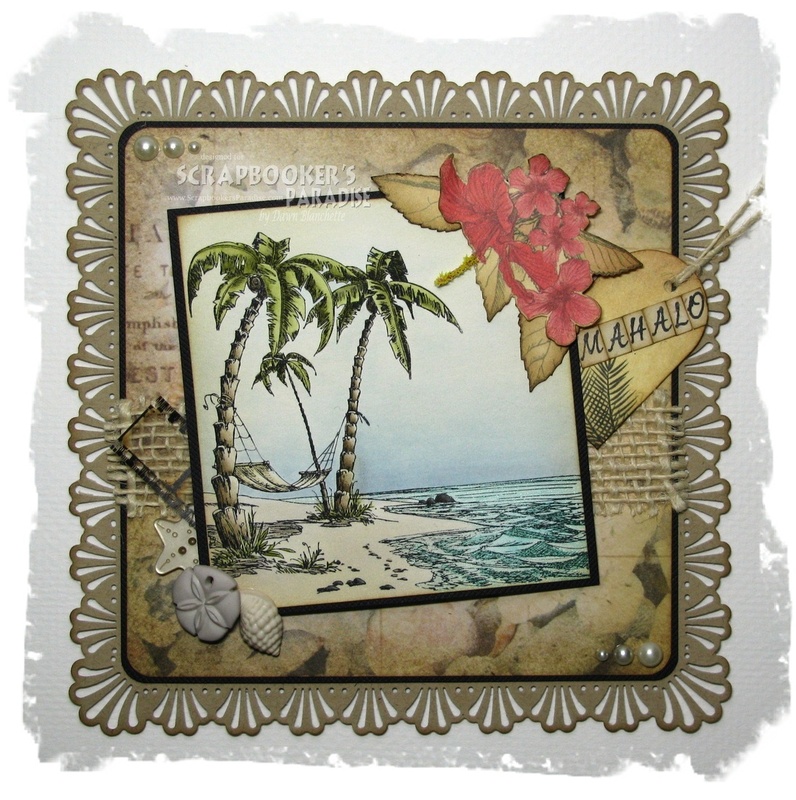 and time for a new Playing in Paradise Challenge over at Scrapbooker's Paradise. Before telling you all about the current challenge, I want to thank everyone who participated in our 100th challenge celebration. I'm glad you could join us and I loved seeing all your wonderful creations! This week, the talented Jessi is hosting and she would like to see you using some wonderful sparkly shimmery pearly sprays on your project. As always, you can make whatever you like using any product you like so long as you follow the theme and create a new project that has not been previously posted. And, as always, there is a fun prize up for grabs, so be sure to check out the challenge for all the details. We recently went on vacation to Hawaii Island, so for my project this week I made a thank you card for my aunt-in-law who looked over our house while we were away. Mahalo is Hawaiian for thank you. I couldn't resist using the Tropicana line from Kaiser Craft once again - it is so gorgeous. Image - Tropicana stamp by Kaiser Craft stamped on 300g hot pressed watercolour paper and coloured with Distress inks (pumice stone, peacock feathers, stormy sky, walnut stain, antique linen, tumbled glass, peeled paint, forest moss, pine needles and black soot) and I made the water shimmery by adding some Lindy's Stamp Gang Glitz Spritz in Royal Peacock Feathers to the ink before painting it on. I think the sparkle shows up if you click on the photo to make it larger. If you haven't been already, please pop over to Scrapbooker's Paradise Playing in Paradise challenge to check out the wonderful work the team has created this week. Then get spritzing and link up your creations. I'm looking forward to seeing your projects! At the volcano, the glow of lava lit up night sky. The amazing Akaka falls - the photo does no justice. The gorgeous Hawaii Tropical Botanical Gardens had some breathtaking sights. And no tropical vacation is complete without watching the sun fall behind the ocean. If you are still here (and awake), thanks so much for popping in and for taking the time to leave a comment. I appreciate each one and love having the chance to visit you too. Totally beautiful, Dawn! I love that scene :) Fab embellishments too - the film strip & those little shells :) Love those! And your pictures - the lava picture is simply amazing. It seriously seems to be moving, the lava's so vibrant!! Your card is gorgeous Dawn. That is such a fabulous image and your colouring is so beautiful. Wow oh wow! Really LOVE your scene and the card you put it in! You do an incredible job colouring! Glad you had a good holiday. Awesome pics... love, love, all the lushness! You created is a dream scene, like your vacation! It's a beautiful thank you card! Such a wonderful card, your image is amazing and so beautifully coloured. Your photographs are stunning what a wonderful holiday you must have had!! these are some amazing places. Hope to go there one day.